Bill Koska has advised and represented our company for over 23 years on matters pending throughout the country. He is prompt, efficient and knows the horseback helmet industry thoroughly, and the issues that confront our business on almost a daily basis. His ability to cut through legal issues and arrive at solutions for our company has been excellent. Because he has been a horseman for over 30 years, he has great insight into the many varied situations which occur with horses. I would recommend Bill without limitation for any issues concerning helmets, horseback riding accidents and collateral issues such as insurance, indemnity and compliance. Beginning 1997, Golden State Water Co., the largest subsidiary of American States Water Company, was sued in some 23 lawsuits in Los Angeles and Sacramento Counties. These cases lasted over 10 years at both locations and Attorney Bill Koska was selected by me to be the "quarterback" to handle all of these cases; using whatever firms and resources he needed. Further, he was the company's 'eyes and ears' in all matters pertaining to these lawsuits and to provide strategic guidance, leading the company to a successful conclusion. After 10 years and 3 published court decisions, our company was completely exonerated and paid the plaintiffs absolutely nothing. At the same time, Bill successfully prosecuted a case against the polluters in Nothern California, leading to an extremely favorable settlement for our company and the customers in Sacramento County. Throughout the 10 year period, Bill supervised all aspects of all the cases, including the most critical case against the polluters (which included a suit against the State of California), which lasted for approximately 5 years during the 10-year time frame. He was in charge of 4 different law firms including his own, and made recommendations upon which all of our decisions were based. The company was involved with the CPUC, EPA, DPH, SEC, and the State Water Resources Control Board. His knowledge of the subject matter and inter-workings of all the agencies involved was invaluable to a company with as many independent water systems as ours. He kept our Board and Officers completely informed, and obtained a tremendous result for the company's customers and shareholders on all fronts. I would unquestionably recommend Bill for any litigation involving utility companies, especially those with multi-faceted issues and agency involvement, as was the case with Golden State Water Company. A peer review by ones colleagues is a very valuable indicator of an attorney's merit. 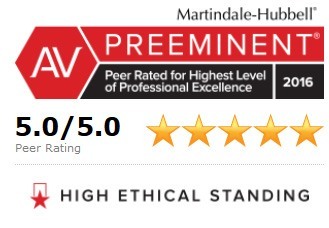 A Martindale-Hubbell rating is exactly that-a peer review. William Koska has been AV rated for over 35 years and AV Preeminent for years.